The Finals Gala was held at the Tercentenary Sports Hall on Saturday, 7th May. Gibraltar ON.tv LIVE! streamed the whole event on the night and here we present an edited copy in VOD (video on demand) as a perminent record for your future enjoyment. 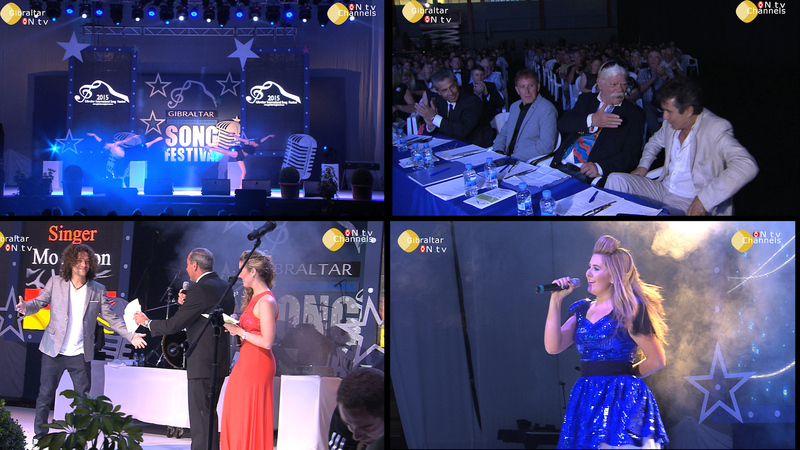 Although every edition of the Gibraltar International Song Festival (GISF) has witnessed an increase in the number of songs received, this year’s edition – held at the Tercentenary Sports Hall on Saturday 9 May, 2015 – has broken all records. Close to 700 songs have been received, some from surprising countries of origin, such as the United Arab Emirates, India, Indonesia, Malawi and Vietnam. The full list of the 28 countries from which entries have been received is as follows (in alphabetical order): Argentina, Brazil, Chile, Colombia, Cuba, France, Georgia, Germany, Gibraltar, Greece, India, Indonesia, Israel, Italy, Malawi, Mexico, Nicaragua, Panama, Peru, Poland, Slovenia, Spain, Sweden, Switzerland, United Arab Emirates, UK, Venezuela and Vietnam. Following the contest the World famous ABBA tribute band Bjorn Again performed to an excited audience – Gibraltar ON.tv filmed this spectacular performance and afterwards our Presenter Michelle Daniels went on to the after-party to talk with the event’s main organisers and to Rod Stephen, Bjorn Again’s founder.